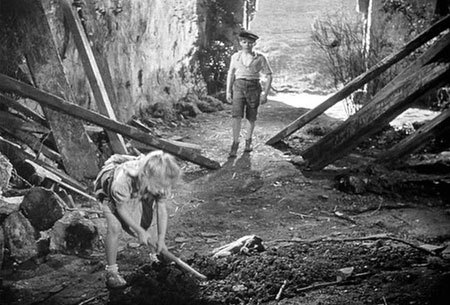 After her parents were killed in a German air raid, five-year-old Parisian Paulette (Brigitte Fossey) winds up taking residence with the Dollés, a peasant family. There, she meets Michel (Georges Poujouly). What starts as a grave for Paulette’s pet dog turns into something much more, as both Michel and Paulette are affected by the death around them. Forbidden Games (Jeux Interdits) is a film directed by René Clément. I can’t really describe Forbidden Games as a war movie as the movie is almost entirely away from the frontlines. It’s more appropriate to describe it as a movie about children in an adult’s world. At first it seems like an introduction to the real world for Paulette, who has only been recently removed from the comforts of city life, Michel also is one to lose innocence. Forbidden Games works very similarly to Godzilla as both are movies that were made when World War II was still fresh in the minds of everyone. While Godzilla was made nine years after the atomic bombings of Hiroshima and Nagasaki, Forbidden Games was made twelve years after France’s humiliating defeat to the Nazi war machine. Like Godzilla, Forbidden Games shows how the horrors of war affect ordinary people, regardless of how far away they are from combat. In the case of Forbidden Games, it was manifested in the feud between the Dollés and the Gouards, who had a son return from combat after his unit was decimated by German forces. As odd as this may sound, Forbidden Games works extremely well as a companion piece to Godzilla. While Godzilla had a more open antiwar message, Forbidden Games clearly doesn’t condone conflict. Unlike Godzilla, Forbidden Games very much is a cinematic masterpiece. Like Godzilla, however, it is also an important movie to see purely for French history, particularly with how World War II influenced ordinary citizens.